Blue Raspberry by Mad Hatter is a fantastic fruit vape from Mad Hatter's I Love Salts line. If you're a fan of any popular blue raspberry candy, you'll love this blend of sweet raspberries and slightly tart nicotine salt juice. 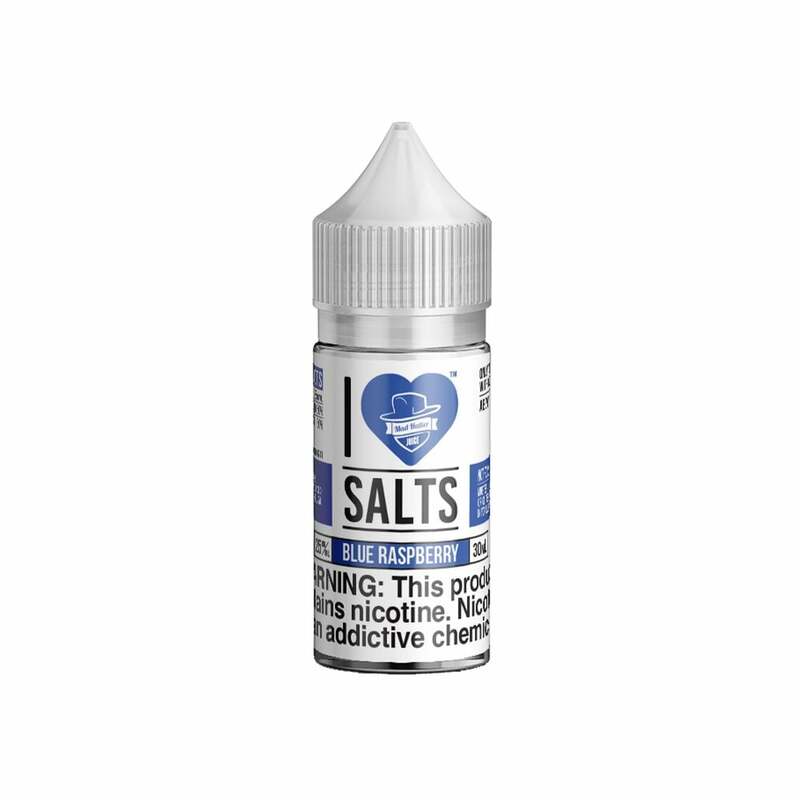 I Love Salts - Blue Raspberry tastes fantastic in any pod mod system, such as the Suorin Drop. I liked this flavor alot at first but after smoking a different product for a few days and going back to this one I realized it had a strong "cigarette" after taste, kind of like tobacco. I guess if you are looking for a tobacco flavor with a raspberry hint this would be the perfect choice. Great flavor and a nice hit. This is the first liquid I've used in a mtl device and it gives me what I missed from cigarettes. Not too Sweet, doesn't leave an after taste in your mouth, easy to vape all day or all week without getting old. I didn't get a hella strong flavor from this, could be my device (Innokin Endura T20-S) But I would reccomend this. A very light Blue Razz flavor that I could smoke over and over without getting sick of it. Absolutely nasty. This juice tastes like the melted slurpee you went back to after leaving in your car for 3 days. Tried it with an open mind on 2 separate occasions and ended up throwing the whole bottle out and cleaning my tank. Didn’t even want to pawn it off onto one of my friends, no one deserves to suffer through that. Flavor is good! but 34mg nic is way too much for me but Flavor is there. Very happy with it. Hubby loves it and it smells amazing. We got our order in 2 days. Super fast. Great company! Fantastic salt juice. Smok novo doesn’t get super strong Flavors, but still get a kinda melted blue raspberry slushee taste from it. Haven’t tried on boyfriends souring for taste comparison, as his souring usually gets great flavors. Has a very nice flavor that does not get old quickly. A little harsh and very sweet. It was ok.
Nice blue raspberry flavor. Not the best I've had but not the worst. I would say average for flavor and throat hit at 25mg level using my Mi Pod. Very smooth tasting juice. Perfect for my breeze 2. Very smooth flavor personality one of my favorites. The best juice ive tried.